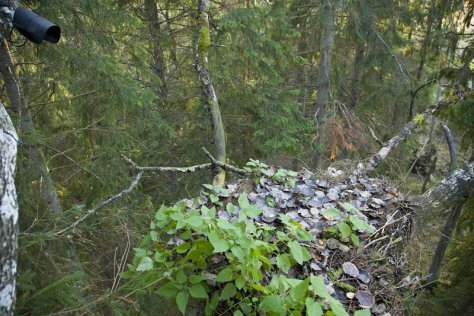 In spring we installed a lesser spotted eagle camera (at the nest of Eha and Koit) and a black stork camera (at the nest of Padis). But as it turned out we only saw the initial phase of nesting in the first case, that is, setting the nest in order. The real nesting took place 50 meters away, in a new nest, and it was not possible to see it in the web camera. It could have been possible to move the camera But we judged that to be too much of a disturbance. Now we know that a lesser spotted eagle pair can have two different nests in the same spring! Next spring we will install the camera early at the new nest. Black stork Padis visited the nest in the spring but he didn’t find a mate. When the lesser spotted eagles arrived they only had to start using the nest already familiar from last year. It is difficult to say if it was a new pair or if Tuuli and Remo moved here from somewhere in the neighbourhood. Constant watchers at least felt that the hatching of a chick seemed to be a first-time experience for Tuuli. But the nesting went very well and the camera didn’t disappoint us either – only some minor problems in the power feed system occurred and those could be repaired without disturbing the nesters. Here too the plan is to set up a camera again next spring. The Lesser Spotted Eagle Forum provides a thorough survey of all that went on in the visible and auditory scopes of both cameras. The nest, garnished with nettles, just before the camera was dismounted.